Sony Ericsson Xperia Play to launch on Verizon? 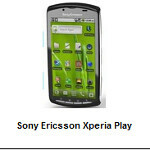 As we reported, Sony Ericsson will be introducing the Xperia Play on February 13th. That, of course, is the day before the start of the MWC in Barcelona. From the beginning when the device was a mere concept, to today's pictures showing a side sliding game controller, video game players have been over eager to get this device in their hands. Because the phone has yet to be introduced, it is unknown which carrier will be launching the Sony Ericsson Xperia Play, but Wirefly might have given away the answer to this mystery. 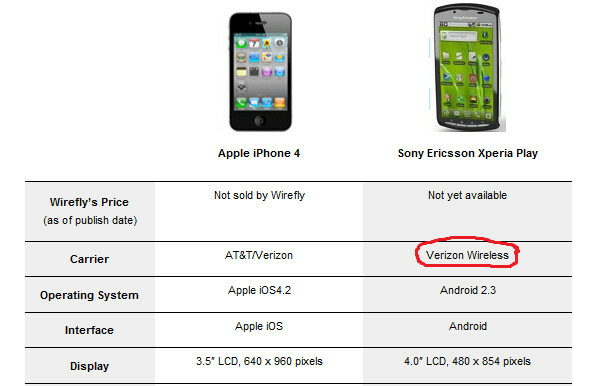 In a comparison chart that shows the specs of the Apple iPhone 4 vs. the Xperia Play, it lists Verizon as being the carrier for the Sony Ericsson handset. Verizon customers could have a tough choice to make. After all, the Xperia Play is no slouch when it comes to specs. The phone will come with Android 2.3 Gingerbread installed right out of the box. A 4 inch LCD display weighs in with resolution at 480 x 854, and there is a front-facing camera. Of course, you can't forget that slide-sliding game controller that has game players excited. Is Wirefly's intelligence correct? By Sunday evening, we should know. Sony Ericsson has had its troubles finding a carrier to subsidize its smartphones in the U.S., but because the Xperia Play is so unique, the joint-venture does have a good shot at getting a major U.S. carrier to sign on the dotted line. For a complete look at the comparison chart, click on the source link. Is the Sony Ericsson Xperia Play going to launch on Verizon? No problem, was just snooping around and though it probably won't happen, now that verizon has lte, could it be a start of something? either way if it lands on att ill buy it off contract as a "new psp" lol. The Galaxy series all have LED displays. xD that's LED technology smart one. well this would be the first time i've ever seen an SE phone even rumored for Verizon. Verizon is going to have so many options it's crazy. Source link has been updated, no carrier is listed now. I don't see it. Not that it wont happen but won't the Xperia Play be available all over the world? So why release it as a CDMA phone and not a GSM? Unless i'm an idiot which I probably am and haven't taken LTE into consideration.